The term “new psychoactive substances” (NPS) can be defined as individual drugs in pure form or in complex preparations that are not scheduled under the Single Convention on Narcotic Drugs (1961) or the Convention on Psychotropic Substances (1971). 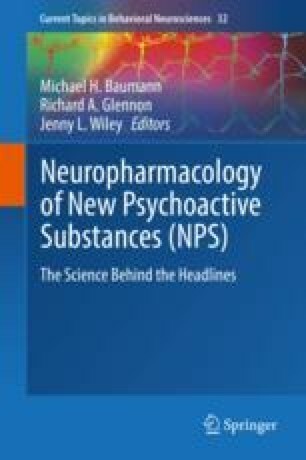 NPS may be categorized by chemical structure, by psychoactive properties, by biological targets, or by source (plant, synthetic, or combined). The emergence of hundreds of NPS in the past decade is challenging for public health and drug policies globally. The novelty of NPS, their ambiguous legal status, ability to evade toxicological tests, swift adaptation to legal restrictions, global Internet marketing, and scant public knowledge of their adverse effects are among the key drivers of this twenty-first century phenomenon. Multi-disciplinary research in areas of biology, epidemiology, prevention, and web analytics are needed to develop effective responses in a domain capable of overwhelming current international conventions and national drug control policies. Ultimately, research-guided prevention education will fortify societies against this tidal wave.